1. Wash the rocks and let them dry. 2. 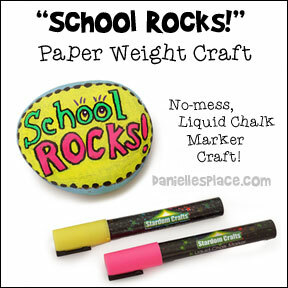 Write "School Rocks!" on the rock with liquid chalk markers and color in around the words. Use the paper weight to organize your desk or as a gift for your teacher. Use scented markers to color in the food pictures. Place the notes in your children's lunchboxes and backpacks to let them know you are thinking about them when they are away from home. These patterns are available in both black and white for coloring and colored patterns. Liquid Chalk Markers - (We used Stardom Chalk Markers) - They are a great value and contain not only the bright neon colors, but also the earthy tones that are great for art projects. 1. Cut the thick cardboard and the cereal box cardboard the same size and glue them together with paper glue. 2. 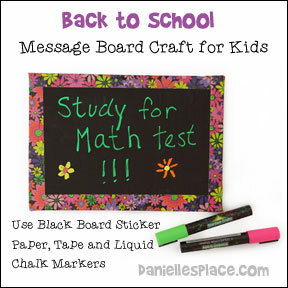 Place the cardboard on top of the chalkboard paper and cut it two inches bigger on each side of the cardboard. 3. Peel off the back of the chalkboard paper and bend it in half so that it is almost folded. Stick the bend of the paper onto the center of the cardboard and smooth out the paper from the center out to the sides with the palm of your hands. When the paper is laying flat turn over the board. 4. Cut a square out of each corner of the chalkboard paper. 5. Stick the paper to the back of the board at the center of each side and then smooth it out to the sides. 1. Cut the oatmeal container or other container so that your pencils or other art supplies can stick out about one inch above the container. 2. Cut construction paper to fit around the container. 3. 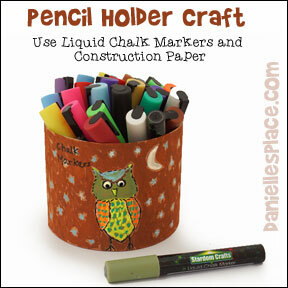 Draw a picture on the construction paper with the liquid chalk markers. 4. 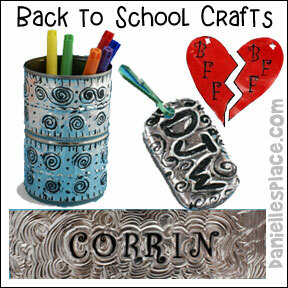 Tape or glue the finished picture onto the container. 5. Cut clear contact paper so that it is about one inch higher than the container. Cover the container with the contact paper so that the contact paper sticks over the top of the container. Cut slits in the contact paper that hangs over the top and then press in down to the inside of the container. 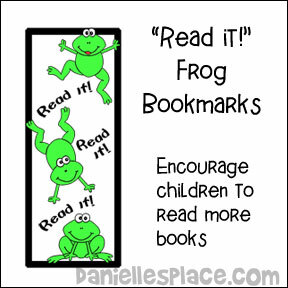 Encourage your children to read more books about Froggy by Jonathan London and have them use this frog bookmark to keep track of how many books they have read. Have them color a frog each time they read a book about frogs. You can give them a frog prize when they have colored in all three frogs. To view pictures of the books Jonathan London has written go to his Web Site. You will also find a printable connect-the-dots work sheet, a hidden picture activity sheet, and which-picture-is-different activity sheet. 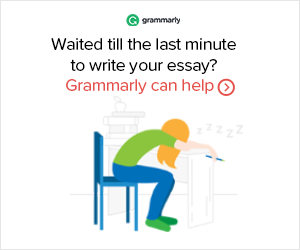 Help make your child's school day a little more enjoyable. 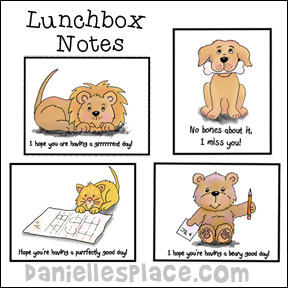 Lunchbox notes are great for children who have a hard time in school and need a little extra encouragement. Let your children know you are thinking about them even when you're not with them. Just print out the cards, cut them apart, and place them in your children's lunchboxes or backpacks. The bear lunchbox note says, "I hope you're having a beary good day!" The kitten lunchbox note says, "Hope you're having a purrfectly good day!" The lion lunchbox note says, "I hope you are having a grrrrreat day!" And the dog lunchbox note says, "No bones about it, I miss you!" "Do your best and God will take care of the rest! 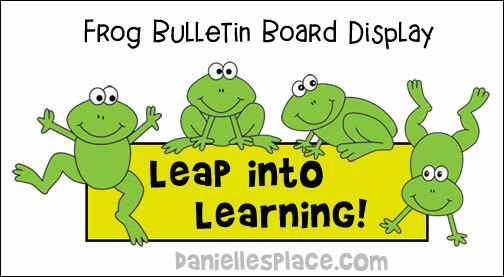 The printable lunchbox notes are available to members. 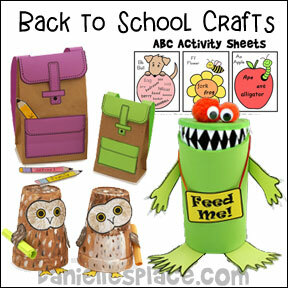 Here are Some Great Crafts and Activities to Prepare Your Child for His First Day of School. 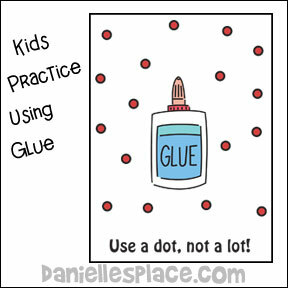 Children practice using just a little bit of glue and learn that a dot can hold a lot. Snails leave sticky, slimy trails everywhere they go. Your children can practice their gluing skills with this fun activity sheet. 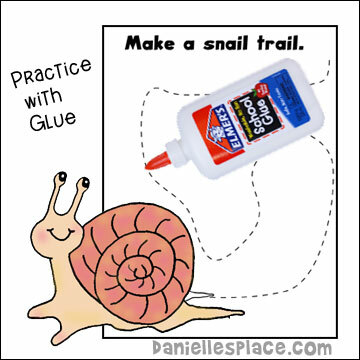 For more snail crafts and activity go to the Snail Craft Page. Your children will enjoy singing this song as they work on their snail trails. Sing to the tune of "London Bridges". Get your children ready for school with these fun memory games. 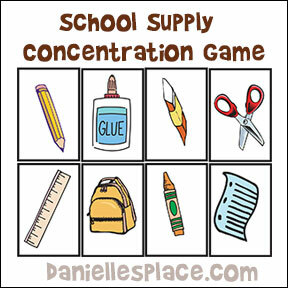 In this fun game children work on their memory and concentration skills by trying to remember which school supply is missing. 1. Place the picture cards in front of your child on a table. Have him name each item. Tell him to close his eyes while you take away one card. Then tell him to open his eyes and try to figure out which picture is missing. 2. Let him take a turn removing a picture and letting you guess what is missing. Note: Instead of using the printout, you can use real items that you have collected for school. 1. Print out two copies of the School Supplies Cards on to card stock and cut the cards apart. 2. Place all the cards on a table face down. 3. Take turns turning over two cards at a time trying to make matches. If a player turns over two cards that match he gets to keep the matching cards and take another turn. The person who collects most of the cards wins. 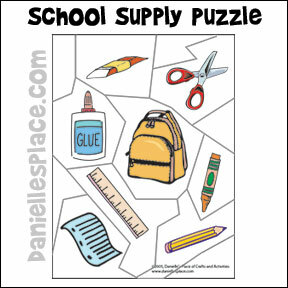 Children practice distinguishing differences among similar objects by assembling this puzzle. 1. Place the puzzle pieces face up in front of your child on a table. 2. Have him see how fast he can put the pieces together. 3. Mix up the pieces again and see if he can put it together faster the second time. 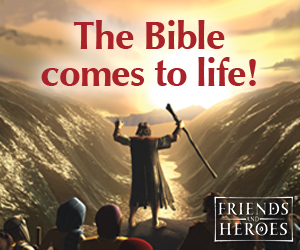 Children will love practice reading with books from popular children's movies! Get your children excited about going back to school with these adorable backpacks! These Dory Action Figures make great learning incentives. Use them as rewards for work completed.